The new report covers global companies like Adaptimmune, Bellicum Pharmaceuticals, Cell Medica, GlaxoSmithKline and 30+ companies. LEWES, DELAWARE, DELAWARE, UNITED STATES, August 21, 2018 /EINPresswire.com/ — T-Cell Receptors (TCR) and Chimeric Antigen Receptors (CAR) are the cutting edge of adoptive T-cell therapy. Both receptors deploy T-cells to target the tumor, but CAR T-cells (CAR-T) are limited to binding to cell surface antigens, while TCR T-cells (TCR-T) recognize peptides (derived from intracellular proteins) presented on the cell surface by the major histocompatibility complex (MHC) class I.
Adoptive T-cell therapy has come of age with the recent approvals of two CAR-T therapeutics targeting CD19 (Kymriah and Yescarta) demonstrating feasibility of clinical development with impressive results and of personalized manufacturing & logistics. It remains to be seen whether these autologous CAR-Ts will live up commercial expectations, as first quarter 2018 sales of Kymriah were far below expectations (only US$ 12 mln). The final prices of US$ 475,000 (Kymriah) and US$ 373,000 mln (Yescarta) are challenging the commercial viability of autologous CAR-T therapy. Allogeneic cell therapy might be one technological solution for the pricing problem. While CAR-Ts performed very well for hematologic malignancies, they did less for solid tumors. Furthermore, CAR-T therapy is restricted to cell surface proteins which constitute about 20-25% of all available targets on a solid tumors, leaving nearly 80% of intracellular targets untapped by CAR-T therapy or by conventional antibody therapy. The concept of TCR T-cell therapy actually predates CAR-Ts, but suffered a series of setbacks due to toxicity caused by cross-reactivity with related and unrelated peptides prompting the development of much more sophisticated specificity screening systems. But TCR-Ts are catching up as evidenced by ten different company-related TCR-Ts entering clinical development in the last two years and further nine in preparation of clinical trials. Significant deals between TCR-T companies and major Pharma/Biotech further underline the promise of TCR-T technologies. 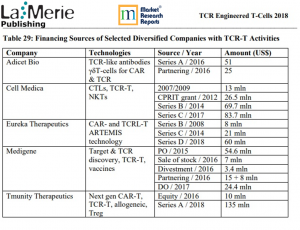 The report can be acquired at MarketResearchReports.com at (https://www.marketresearchreports.com/la-merie-publishing/tcr-engineered-t-cell-therapy-2018-industry-analysis-technologies-pipelines ). There you will find samples pages, a detailed Table of Contents, a list of Tables and of companies discussed in the report.